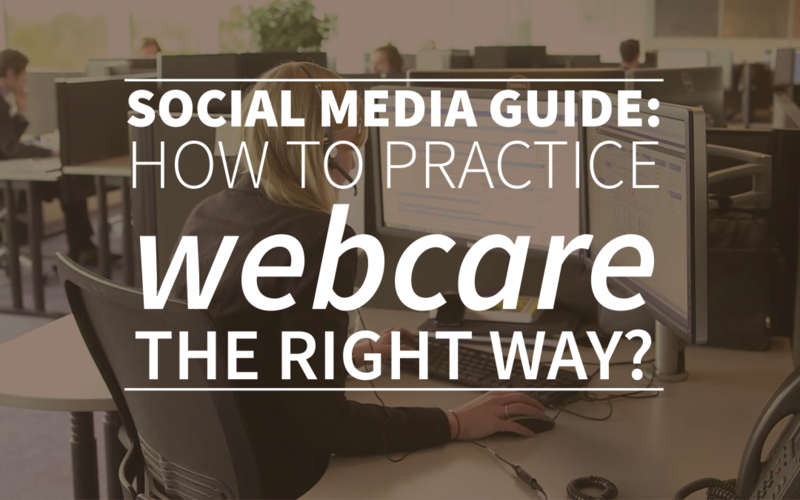 Social media guide: How to practice webcare the right way? Nowadays, most of us can’t think about a world without social media. This new layer of virtual contact developed itself very quickly and millions of people communicate online to each other every day. Also as a business you need to be present online and on social media, because your customers expect nothing less. But how do you respond in the right ways to this endless stream of information? How do you make sure that your presence online makes things better for your company and not worse? That’s why we decided to take you on a trip into the world of webcare. In the next few minutes we’ll explain the 4 ways you could respond to your customers. Choose the right way in the right situation and soon you’ll be a king in webcare! In general, there are 4 ways to respond to all kinds of questions, complains and compliments. There are no exact rules on which way of responding is the best in which situation. This is exactly why webcare is also something that requires a lot of knowledge of human nature. The first way you can respond to your customers, fans or followers is to react directly with an appropriate response. For example, thank someone for their compliments, answer to a simple question or ask someone to take an action. It’s a myth that you should only react to negative messages about your brand, company or products. By responding to positive comments you’ll show your customers that you truly care about them and not only about your own reputation. That’s exactly why it’s called webcare, the perfect way to take care of your costumers and to connect to them on a one on one basis. Sometimes you need to do some research before you can answer some ones question properly. In this case, you should always let people know that you’re working on it. Otherwise, it will look like you’re ignoring their complains or question. If you need some more personal information before you can answer their question, ask them to send you a private message with the information you need. Also with complains this is a good way to handle them. You’ll show to the rest of your customers that you take them seriously and if it gets out of hand you’ll be able to keep it more private. It’s also possible to take immediate action after a comment, for example if they ask you to change a spelling mistake in your blog post. This option is the best to choose if you know for sure that the action doesn’t have any big consequences. After you’ve taken action, you can thank the person that attended you on the mistake (or whatever other action you had to take) to finish the costumer experience. In some of the situations it’s the best choice not to respond at all. For example, if someone attacks you on a personal level without any relevance or people just react to your new campaign or something like that. You can’t react to anyone, so make sure that you make the right choices while you’re practicing webcare.